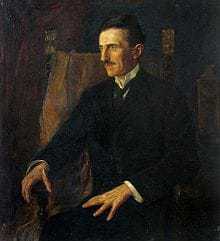 Serbian-American inventor Nikola Tesla was born in July of 1856, in what is now Croatia. He came to the United States in 1884, and briefly worked with Thomas Edison before the two parted ways. He sold several patent rights, including those to his alternating-current machinery, to George Westinghouse. His 1891 invention, the “Tesla coil,” is still used in radio technology today. Tesla died in New York City on January 7, 1943. Famous Serbian-American inventor Nikola Tesla was born on July 10, 1856, in what is now Smiljan, Croatia. Tesla’s interest in electrical invention was likely spurred by his mother, Djuka Mandic, who invented small household appliances in her spare time while her son was growing up. Tesla’s father, Milutin Tesla, was a priest. After studying in the 1870s at the Realschule, Karlstadt (later renamed the Johann-Rudolph-Glauber Realschule Karlstadt); the Polytechnic Institute in Graz, Austria; and the University of Prague, Tesla began preparing for a trip to America. Tesla came to the United States in 1884, and soon began working with famed inventor and business mogul Thomas Edison. The two worked together for a brief period before parting ways due to a conflicting business-scientific relationship, attributed by historians to their incredibly different personalities: While Edison was a power figure who focused on marketing and financial success, Tesla was a commercially out-of-tune and somewhat vulnerable, yet extremely pivotal inventor, who pioneered some of history’s the most important inventions. 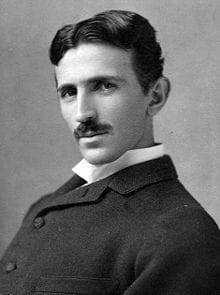 His inventions include the “Tesla coil,” developed in 1891, and an alternating-current electrical system of generators, motors and transformers—both of which are still used widely today. On the AC electrical system alone, Tesla held 40 basic U.S. patents, which he later sold to George Westinghouse, an American engineer and business man who was determined to supply the nation with the Tesla’s AC system. He would succeed in doing just that, not long after purchasing Tesla’s patents. Around this time, conflict arose between Tesla and Edison, as Edison was determined to sell his direct-current system to the nation. According to the Tesla Memorial Society of New York, Tesla-Westinghouse ultimately won out because Tesla’s system was “a superior technology,” presenting greater “progress of both America and the world” than Edison’s DC system. Outside of his AC system patents, Tesla sold several other patent rights to Westinghouse. At the 1893 World Columbian Exposition, held in Chicago, Tesla conducted demonstrations of his AC system, which soon became the standard power system of the 20th century, and has remained the worldwide standard ever since. Two years later, in 1895, Tesla designed the first hydroelectric powerplant at Niagara Falls, a feat that was highly publicized throughout the world. Around 1900—nearly a decade later after inventing the “Tesla coil”—Tesla began working on his boldest project yet: Building a global communication system—through a large, electrical tower—for sharing information and providing free electricity throughout the world. 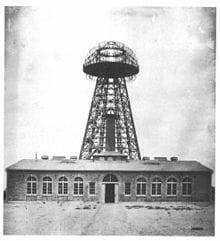 The system, however, never came to fruition; it failed due to financial constraints, and Tesla had no choice but to abandon the Long Island, New York laboratory that housed his work on the tower project, Wardenclyffe. In 1917, the Wardenclyffe site was sold, and Tesla’s tower was destroyed. 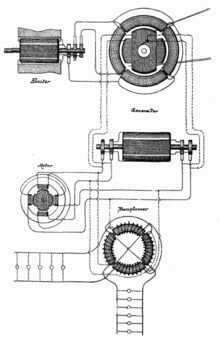 In addition to his AC system, coil and tower project, throughout his career, Tesla discovered, designed and developed ideas for a number of important inventions—most of which were officially patented by other inventors—including dynamos (electrical generators similar to batteries) and the induction motor. He was also a pioneer in the discovery of radar technology, X-ray technology and the rotating magnetic field—the basis of most AC machinery. Tesla was not without his major faults, however, as he supported the use of population control via eugenics and forced sterilizations. Several books and films have highlighted Tesla’s life and famous works, including Nikola Tesla, The Genius Who Lit the World, a film created by the Tesla Memorial Society and the Nikola Tesla Museum in Belgrade, Serbia; and The Secret of Nikola Tesla, which stars Orson Welles as John Pierpont Morgan (J.P. Morgan). In recent years, a street sign entitled “Nikola Tesla Corner” was installed in honor of the famous inventor, near the 40th Street-6th Avenue intersection in New York City. Over the past several years, several nonprofit organizations, high-profile individuals, municipalities and Tesla enthusiasts have been involved in a different kind of effort to uphold Tesla’s legacy: A project to preserve Tesla’s still-standing, still-abandoned New York laboratory, Wardenclyffe, and turn it into a museum of the famous inventor’s work. For more than a decade, New York’s Nikola Tesla Science Center has been working to gain momentum and, subsequently, funding for preserving Wardenclyffe. Since then, the lab’s ownership has been passed through several hands, and public interest for the project has slowly but steadly been growing. Interest escalated in February 2009, when the Wardenclyffe site was posted for sale, for nearly $1.6 million. For several years, the Tesla Science Center worked diligently to raise funds for the lab’s preservation. The TSC was able to purchase the property in 2013 and plans to turn the site into a science museum. Nikola obtained around 300 patents worldwide for his inventions. Some of Tesla’s patents are not accounted for, and various sources have discovered some that have lain hidden in patent archives. There are a minimum of 278 patents issued to Tesla in 26 countries that have been accounted for. Many of Tesla’s patents were in the United States, Britain, and Canada, but many other patents were approved in countries around the globe. Many inventions developed by Tesla were not put into patent protection. U.S. Patent 0,511,916 – Electric Generator – 1893 August 19 – Combination with the piston or equivalent element of an engine which is free to reciprocate under the action thereon of steam or a gas under pressure, of the moving conductor or element of an electric generator in direct mechanical connection; Engine and generator being adjusted by their relative adjustment with respect to period to produce currents of constant period; Electric generator having inducing or induced elements one of which is capable of oscillation in the field of force, the movable element being carried by the piston rod of the engine; Relation as to respect of period of electrical vibration will not disturb the period of the engine; Cylinder and piston reciprocating by steam or gas under pressure of a spring maintained in vibration by the movement of the piston, and the electric generator, the movable conductor or element of which is connected with the piston; Method of constructing and adapting elements; Imparting the oscillation of an engine to the moving element of an electric generator and regulating the period of mechanical oscillation by adjustment of the reaction of the electric generator. U.S. Patent 0,512,340 – Coil for Electro-Magnets – 1893 July 7 – Effect of mutual relation self-induction exploited; Adjacent coil convolutions formed parts exists so that the potential difference is sufficient to neutralize negative effects; Object to avoid expensive, cumbersome, and difficult condensers; Bifilar coil winding technique. U.S. Patent 0,517,900 – Steam Engine – 1893 December 29 – Cylinder and reciprocating piston (with a spring) and controlling slide valve of an engine adapted to be operated by steam or a gas system under pressure of an independently controlled engine of constant period operating the said valve. U.S. Patent 0,583,953 – Apparatus for Producing Currents of High Frequency – 1897 June 8 – Related to US568176; Conversion of electrical current of ordinary character into high frequency and high potential; Can use either continuous (i.e., direct) or alternating currents. U.S. Patent 0,593,138 – Electrical Transformer – 1897 November 2 – Novel form of transformer or induction-coil and a system for the transmission of electrical energy by means of the same; Improvement of electrical transformers; Develops electrical currents of high potential; Corrects construction principles heretofore manufactured; Higher potential for transmission than has ever been practically employed heretofore; Free from the danger of injury from the destruction of insulation; Safe to handle; High-frequency power supply for lighting and other applications. U.S. Patent 0,645,576 – System of Transmission of Electrical Energy – 1900 March 20 – Commonly referred to as the radio patent; Related to wireless telegraphy; Wireless transmission of electric power through the natural media; Cites well known radiant energy phenomena and the experiments of William Crookes; Corrects previous errors in theory of behavior when used by the methods and means of Mr. Tesla; Discovery of highly important and useful facts which heretofore have been unknown; Deprive dialectic of air when impressing electromotive forces of a certain character and magnitude unto it; Conductivity of the air increases with the augmentation of the pressure and the rarefaction; Law of conductivity of the air is quite different from heretofore established; Illustrations of the facts. U.S. Patent 0,685,953 – Apparatus for Utilizing Effects Transmitted from a Distance to a Receiving Device through Natural Media – 1899 June 24 – Heinriech Hertz methods cited; Induction method cited; Ground conduction method cited; Previous methods had limitations that result in great disadvantages for utilization; Wireless transmission developed by Tesla cited; Transmitting station coil arranged and excited to cause arbitrary or intermitted oscillation propagation to another remote point receiver station coil; Air is an excellent insulator; Air strata used for means of conduction for production of generating actions at a distance; Use of metallic conductor; Transmitting apparatus of signals or intelligence should produce effect as strong as possible; Charge a condenser or capacitor to utilize the potential energy. U.S. Patent 0,685,954 – Method of Utilizing Effects Transmitted through Natural Media – 1899 August 1 -Utilizing effects or disturbances transmitted through the natural media, which consists on charging a storage device with energy from an independent source, controlling the charging of said device by the actions of the effects or disturbances (during succeeding intervals of time determined by means of such effects and disturbances corresponding in succession and duration of the effects and disturbances), and coincidentally using the stored energy for the operating a receiving device; Independent source may be at a distant transmitting electrical energy; Receiving device circuit discharges the accumulated stored energy (which may be potential energy) and causing variations in resistance in a circuit including an independent source of electricity and a storage device; Effecting the storage (such as, in a condenser) during any desired time interval and under control of such effects of disturbances; Accumulated energy may operate a transformer (by discharging through a primary circuit at predetermined times) which, from the secondary currents, operate the receiving device. U.S. Patent 0,685,955 – Apparatus for Utilizing Effects Transmitted From A Distance To A Receiving Device Through Natural Media – 1899 June 24 – An apparatus for transmitting signals or intelligence through the natural media from a sending station to a distant point the combination of a generator or transmitter adapted to produce arbitrarily varied or intermitted electrical disturbances or effects in the natural media, and for utilizing electrical effects or disturbances transmitted through the natural media, the combination with a source of such effects of disturbances of a charging-circuit adapted to be energized by the action of such effects or disturbances, between which a difference of potential is created by such effects or disturbances, a storage device included in the charging-circuit and adapted to be charged thereby, a receiver, a means for commutating, directing, or selecting the current impulses in the charging circuit so as to render them suitable for charging the storage device, a device for closing the receiving-circuit, means for causing the receiver to be operated by the energy accumulated in the storage device at arbitrary intervals of time when connecting the receiving-circuit with the storage device for periods of time predetermined as to succession and duration, and means for discharging the storage device through the receiving-circuit at arbitrary intervals of time. U.S. Patent 0,685,956 – Apparatus for Utilizing Effects Transmitted through Natural Media – 1899 August 1 – Related to his Magnifying Transmitter; Used as part of Tesla’s Colorado Spring receivers that posed a distributed high-Q helical resonators, radio frequency feedback, crude heterodyne effects, and regeneration techniques; an apparatus for transmitting signals or intelligence through the natural media from a sending station to a distant point the combination of a generator or transmitter adapted to produce arbitrarily varied or intermitted electrical disturbances or effects in the natural media; combination of a source of electricity, a transformer, a device normally of high resistance but adapted to have its resistance reduced when acted upon by the effects or disturbances, with a receiving circuit connected with a condenser and a deceived adapted to open and close the receiving circuit at predetermined intervals of time. 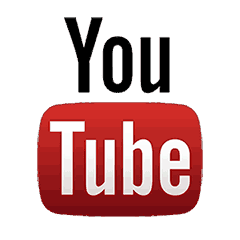 U.S. Patent 0,723,188 – Method of Signaling – 1900 July 16 – Elevated transmitter capacitance; Coil; Earth electrode; Signal generator; Partial basis of radio design. U.S. Patent 0,725,605 – System of Signaling – 1900 July 16 – Elevated transmitter capacitance; Coil; Earth electrode; Signal generator; Apparatus of and method for electrical disturbance or impulses; Transmission of intelligent messages; Govern the movement of distant automata; Radio transmissions; Partial basis of radio design. U.S. Patent 0,787,412 – Art of Transmitting Electrical Energy through the Natural Mediums – 1900 May 16 – Elevated transmitter capacitance; Coil; Earth electrode; Signal generator; Apparatus for generating and receiving electrical signals; Tuned resonant circuits; Physics of propagation; Non-Hertzian notes; Globe as conductor; Low frequency oscillations; Basis of radio. U.S. Patent 1,119,732 – Apparatus for Transmitting Electrical Energy – 1902 January 18 – High-voltage, air-core, self-regenerative resonant transformer; Oscillator for wireless transmission of electromagnetic energy.